Weighing Pig Personality Is One Sow Better Than Another in Group Housing? Piglet #3 is not sure what to make of the empty kiddie pool where she finds herself standing at the UC Davis Swine Research and Teaching Facility. She grunts softly, sniffs at the ribbed-plastic floor, and glances at the humans watching her explore. Horback is conducting personality tests with several 4-week-old female piglets, identifying aggressive and social behaviors, measuring response to human handling and approach, assessing willingness to explore an open field, and studying alarm response to a novel object. Horback has studied animal cognition in several mammal species, including elephants, chimps, prairie dogs, dolphins and whales. 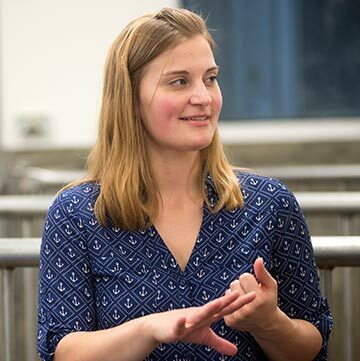 At UC Davis, she is building on her pioneering research examining the role personality plays in the welfare and sustainable production of farm animals, like cattle, sheep and swine. Horback’s research is helping the nation’s pork industry adapt to new legislative and marketplace demands to raise pigs in group housing rather than in individual crates, which have been the norm for the last 40 years. There are currently more questions than answers in the field of pig personality, but Horback knows one thing, for sure: A pig is not a pig is not a pig. Pigs are hierarchical, and battles for dominance can get bloody. Fifty years ago, pigs were housed in open barns and had to fight for the feed farmers tossed on their floor. Dominant pigs got more, timid pigs got less, and some pigs suffered miscarriages in the scramble. To protect pigs and their productivity, the industry switched to “gestation stalls,” which are 2-by-7-foot enclosures that let each sow eat in peace but do not provide enough room for them to turn around. Prompted by complaints from animal-welfare groups, consumers, and 70 brand-name retailers like McDonald’s, the pork industry is now transitioning from crates to group pens. Gestation stalls have been banned in the European Union and in 10 U.S. states, including California. Working with Parsons and other colleagues, Horback is helping farmers and pigs adapt to housing that provides room to roam and protection from aggressive kin. Personality research can help. Farmers prefer pigs that gain a lot of weight, and aggressive piglets often eat more. But if dominant pigs get fat at the expense of the others, that might not provide a net gain. If you remove aggressive pigs from the group, will social and passive pigs grow bigger and be more content? 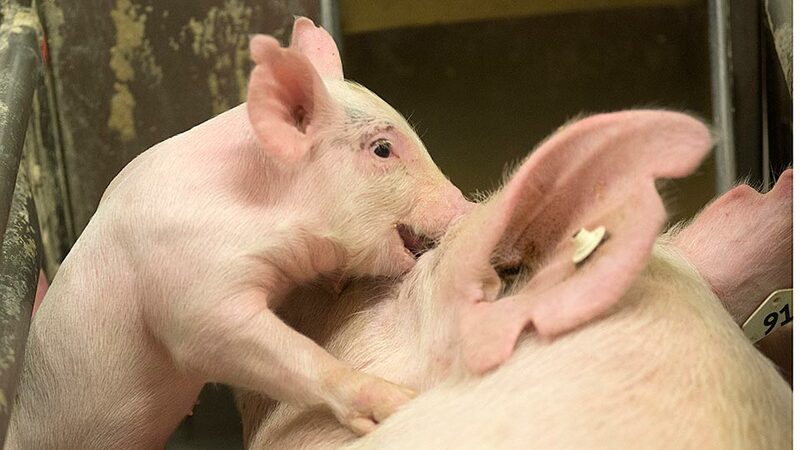 Researchers also wonder whether bold pigs are better equipped to deal with another sow’s aggression, or if a few dominant personalities improve social order. Spunky, aggressive piglets squeal (loudly!) when held firmly by humans for one minute. Passive pigs do not squeal as much when handled, perhaps out of resignation. Sociable sows are the first to sniff their fellow pen mates, and they interact more easily with humans — snuffling at their boots and such. Fearful pigs often freeze when they are isolated in a strange environment, which takes us back to the empty kiddie pool where piglet #3 is standing at the UC Davis Swine Facility. Piglet #3 is not overly vigilant — not pacing or frozen in place. Horback is also assessing how pigs respond to a novel object — in this case the blue, vibrating Bumble Ball she places in piglet #3’s makeshift pen. The toy bounces in unpredictable patterns and can lurch forward without warning, simulating a predatory attack. Piglet #3 keeps a close watch on the Bumble Ball before sniffing it and rooting at the floor. In addition to measuring personality traits, Horback will soon start testing piglets for “cognitive bias,” or mood, to see if certain personality traits correlate with “positive affective states,” or optimism. In previous research, Horback has seen evidence of a link between aggressive personalities and a positive mood.